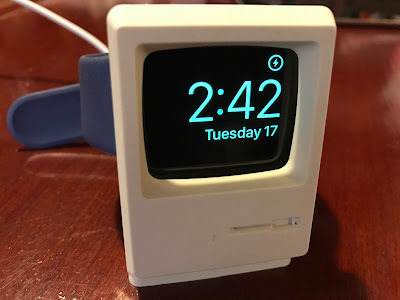 A replica Macintosh charging stand for your Apple Watch, it works with series 1 and 2. It is made of rubber, just feed your charging cable through the stand, your watch slides down inside it. Very sturdy, it doesn't tip over, it's rubber on the outside but weighted on the inside. A very neat charging stand for any Apple fan with an Apple Watch.